The scene about two hours after sunset from near Phoenix, Arizona on Friday, Feb. 27, 2009. Simulated sky map made using Starry Night Software. It has been a superb winter for viewing the queen of the planets, Venus. February marks the pinnacle of its evening visibility as it stands like a sequined showgirl nearly halfway up in the western sky at sunset. You can't miss it. Just look west after sunset. In fact, you can see it during the day if you know where to look. Find it just after sunset one evening, then scan around the same spot just before sunset the next day. Currently shining at its greatest brilliance for this current apparition, this dazzling evening "star" currently appears as a distinct crescent shape in small telescopes, which is growing progressively larger in size as it approaches our Earth; its cloudy disk is now about one-fourth illuminated and shrinking nightly but right now its diminishing phase exactly offsets the gain in brightness from its growing apparent size. It is what astronomers call the "greatest illuminated extent" of this planet's disk. 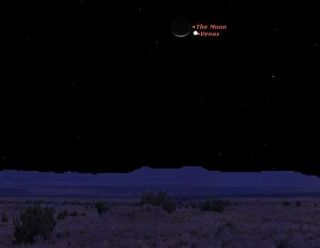 On Friday night, Feb. 27, a lovely crescent moon will appear to snuggle up close to Venus, particularly for skywatchers across the Western Hemisphere. It will make for an eye-catching scene as the two brightest sky objects of the night dominate the early evening scene for about three hours after sundown; even those who do not normally look up will likely have their attention drawn to this "dynamic duo" during their normal commute home from work or school. What will make this array especially attractive is the fact that it will look almost three-dimensional; the moon will look almost like an eerily illuminated blue and yellow Christmas ball hovering next to the brilliant-white diamond that is Venus [Video]. Sadly, this will be the last in the current series of evening get-togethers between the moon and Venus, for during March Venus will slide rapidly down into the sunset glow and by month's end will disappear from our evening sky until the spring of 2010. So why is it that when the moon is a crescent phase we can also see its darkened portion faintly glowing? On Tuesday, Feb.24, for example, there’s a New moon for us, but as seen from that part of the moon that faces our planet that day, there would appear in the lunar sky a brilliant Full Earth. Later on in the week, the first appearance of a hairline sliver of a crescent moon appearing low in our western twilight sky is a sky signal by which the ancients set their calendars. With each passing night as the crescent slowly widens and it begins to appear against a progressively darker background, its entire globe can be glimpsed; the waxing crescent moon appearing as a thin arc of yellowish-white light enclosing a ghostly bluish-gray ball. Sunlight is responsible for the crescent, yet the remainder of the moon appears to shine with a dim blush-gray tone. This vision is sometimes called “the old moon in the young moon’s arms.” Leonardo da Vinci (1452-1519) was the first to recognize it as earthshine. In da Vinci's Codex Leicester, circa 1510, there is a page entitled "Of the moon: No Solid Body is Lighter than Air." He stated a belief that the moon – like our Earth – possessed its own atmosphere and oceans. The moon was an excellent reflector of light, da Vinci believed, because it was covered with so much water. As for the "ghostly glow," he explained, that was due to sunlight bouncing off Earth's oceans and, in turn, hitting the moon. We know today of course, that the moon has no oceans or seas, and so far as the ghostly glow was concerned, as was noted above, the effect is due chiefly to sunlight reflected off clouds as opposed to being reflected off the oceans. Nonetheless, da Vinci had the right idea; that faint bluish-gray glow is light from the Earth reflected back to the moon. The Earth’s light of course is reflected sunlight, so earthshine is really sunlight which has been bounced through space no fewer than three times: reflected first off of Earth, then out to the moon . . .and then in turn reflected back to Earth. Friday, Feb. 27 is the night when the Americas will be greeted with one of the most beautiful Venus-crescent moon conjunctions possible. The pairing will persist from before sunset on into the depths of darkness. In fact before sunset, the moon will serve as a great benchmark for finding Venus in the daytime. The time when moon and planet will appear closest will be around 8:30 p.m. Eastern time, which corresponds to 7:30 p.m. in the Central time zone; 6:30 p.m. for Mountain Time and 5:30 p.m. for Pacific Time. From some locations, Venus will appear to hover approximately 1.5-degrees above and to the right of the 10-percent illuminated moon (the moon itself appears one-half degree in diameter). For cities situated in the Mountain time zone, the time of closest approach will come during evening twilight, while for those in the Pacific time zone it takes place around, or just prior to sunset. From other places around the world, the pairing will appear a bit different primarily because the moon appears to move much more rapidly against the background stars than Venus, and also because of the effect of parallax: different viewing angles from different points on our planet. From Europe, for instance, Venus will appear to hover majestically about 4-degrees directly above the moon at sunset. South Americans will see the moon with Venus to its right; the pair low in the west-northwest at dusk and appearing to set side-by-side. From Australia, the moon will be positioned far to the lower left of Venus on the evening of Feb. 27 and a somewhat similar distance to its upper right the following evening. Finally, if you're watching with some friends, here's a trivia question you might want to pose to them: Of the two which do they believe is the brighter: Venus now at its peak brilliance or the three-day old moon? The almanacs say that the moon is 8.5 times (2.3 magnitudes) brighter, but because its light is not concentrated into a point like Venus, they may have a difficult time believing this!